Are the pictures of the tank that you just put the CUC in? NO, I put the CUC in the 14 gallon that finished cycling about a week ago. This is my 28 gallon it has no life in it other than live rock and live sand. It looks like mostly normal diatoms. However, there appears to be some red stuff; is that cyano? if so, check source water presuming that you are not feeding. I generally keep the light cycle relatively short while cycling the tank. Looking Good! I am starting to really really want a Midas Blenny! New pic of my tank. I'm so excited that my 28 has cycled! Maybe I wlll take a couple of snails and crabs out of my 14 and add to this one. There is a lot of brown looking algae on the rocks and starting on the glass so I think it's about ready. Can't wait to add corals to this one. I have some arriving on Tuesday for my 14 gallon . You give us all something to aspire too! I have not made any mod's or upgrades to my tank I am running it stock! Using a sponge and purgien in the ref. I am using a fan to keep the temp in check and have plans to purchace a chiller. I have 23 lbs of LR and 25 lbs of LS, 6 corals, 3 fish, 5 snails, 5 crabs and a lobster. So far so good, keeping my fingers crossed! Sorry I can't help you with that I don't understand why you thought I have pc lighting because I have MH HQI 150W -14K lighting! Anyone have pics of their non-chiller chilling solutions? I have a 12v DC power supply and fans to do evaporative cooling but wanted to get an idea of what others are doing before I mod/fab something for this tank. Thetiler Ill get a pic up for you tomorow of my light mod. The 54 watts of pcs is just like the 2x18 watt pc upgreades that you can get from nanocustomes.com but I got my from my old AP 12 hood. They are pretty simple to install and I even think they have a video on there site showing how to install the pcs. Hey badbread my hood is lifted but it is not connected to the hinges anymore. I went to petco and bought some coralife legs made for a pc hood and just screwed them onto the stock NC hood with tiny screws. It makes the tank still look stock but now I have a cooler running tank with more oxygen exchange . As for the pics of the hood being raised I posted them on my tank thread in my signature if you want to see how I did it. If you guys have anymore questions just let me know. Everyones tanks are looking great and keep up the good work. I'll be setting one of these up in the next couple of weeks. 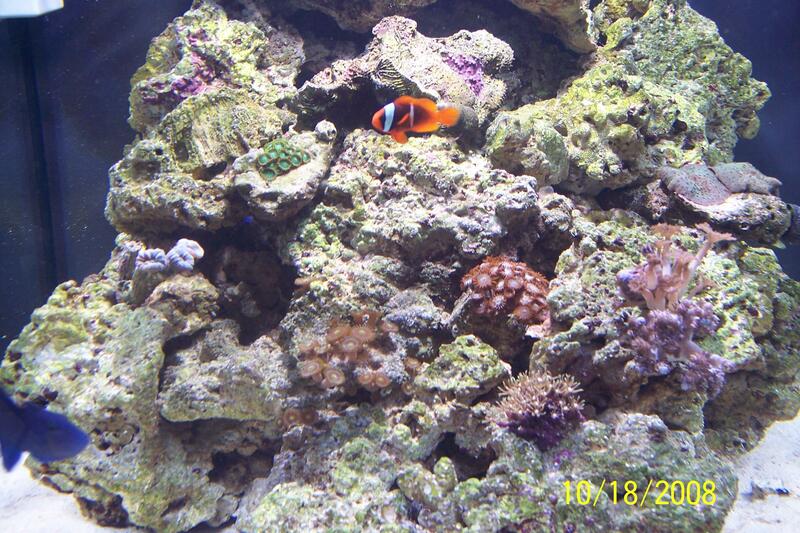 This will be my 1st reef tank. I had a marine FO, but thats been about 15 years ago. I'll be back with pics and updates in a few months. Same for me! Although I probably won't start setting up til after Thanksgiving at the earliest. I'm still doing my research, but this is the system I've settled on. Keep up the great info everyone, this helps a great deal. Question for you all. I want to upgrade the stock pumps cause I feel that the flow is not good enough. What fits in those spots? I just want some more power? Do the MJ's fit or too big cause the 1200 for my skimmer seems too big? I upgraded the pumps with maxi-jet 1200. I still felt that there was not enough flow so I added koralia nano and koralia 1. I am now happy with the amount of flow. I dont know about the airstone as I upgraded skimmer as well. I know that petco has some red sea max stones. Not sure if they will work though. Hey thetiler heres a pick of what my hood looks like. I got this from nanotuners.com and thats also were you can find the kit to do it too. http://www.nanotuners.com/product_info.php...products_id=435. I also got some new coral added to the tank. You guys should check it out and let me know what you think. And when I was using my stock skimmer I just went to petsmart and got their ceramic airstones and I think they worked better than the wooden ones. I have not upgraded my pumps yet but I read on one of the forums that the MJ600 fits just fine! I get my airstones from my LFS he carries them! Hi Everyone! Just started my first SW tank, 28g JBJ HQI. I'm looking forward to this new adventure. Right now, I have a bucket-'o-saltwater. I was a little concerned about some package dents from shipping so I filled it up right away to be sure everything was intact and working properly. Over the next few weeks I'll be picking up the heater, and water testing supplies, and other basic equipment. Mostly I'll be running stock as I learn. The plan is to start FOWLR. great to read about all you experiences! anyone know what the stock pumps push out GPH?